When I study my personal family heroes (uncle Walt, Lyle Patterson, father-in-law Walt King, mother Kathleen, wife Susie, children Jennifer and Jay), they also model the: “All Things Principle.” They were/are ordinary people who did/are doing extraordinary things with their lives. They proved to me the truth and reality of the “All Things Principle.” If, and only if, I truly love God and live according to His, and only His, purpose, “ALL THINGS WORK TOGETHER FOR GOOD,” although they may not be good. But, in God’s hands, He can take things that seem bad and put them in the crucible of His love and wisdom. In retrospect, three main events in my life have exemplified this to me. As an 18-year-old, a friend betrayed me which led to declining a full scholarship elsewhere and then attending the U of Idaho. Result: marriage to Susie King and U of Alaska head basketball position at age 23. As I had to leave a later coaching position with Athletes in Action at age 29 due to a very ill child, I then moved to Spokane to counsel people. Result: the birth of NBC Basketball Camps. As I developed cancer in 2004, the long journey has turned out to be the blessing of being a new, different man who has discovered the mystery of freedom from the pressures of this world. No suffering is wasted. At times, God seems to teach backward–gives the test first and then the lesson. However, this gives us hope! God is not dead! 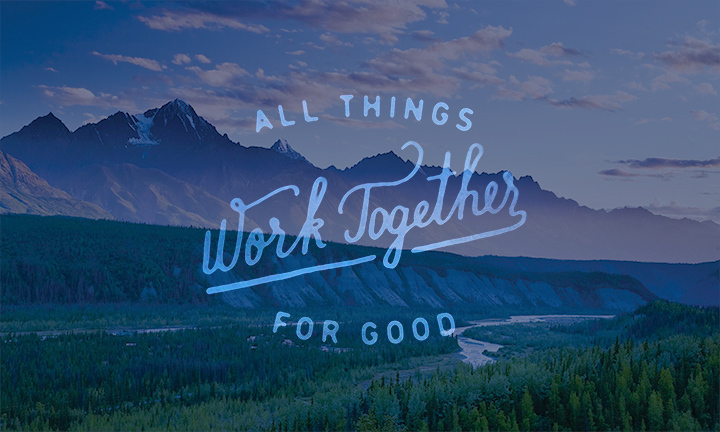 “ALL THINGS WORK TOGETHER FOR GOOD” is a certainty and promise, not a wishful thought or a maybe. Often, it is to bring us to God for the first time or to continue to make us more like Himself–in His holiness, peace, happiness, and cooperation for the furtherance of His higher design. St. Paul wrote in Romans 8:28, “And we know that in all things God works for the good of those who love him, who have been called according to His purpose.” St. Paul wrote these words to his brothers and sisters while he was going through trials; he believed it, loved it, lived it, experienced it. I, too, am trying to live it.